Riding the wave of Mendelssohn’s popularity as an organist during his visits to Britain, the Six Grand Sonatas for the Organ (1845) were commissioned by the English publishers Coventry and Hollier. The composer’s recitals included improvisations – famed for their variety and novelty – and performances of the works of J.S. Bach, and both elements are reflected in his organ sonatas. But Mendelssohn never performed his organ sonatas in England. At the time of Mendelssohn’s first visit to England in 1829, English organs reflected an insular tradition that differed greatly from organ building on the continent: they had a very heavy keyboard action and no full pedal board. However, the increased awareness and interest in the organ music of Bach generated by Mendelssohn through his organ recitals contributed to a rapid change in organ design and construction during the 1840s, as English organ builders took inspiration from the instruments of the German Baroque. The genesis of Mendelssohn’s great anthem ‘Hear my prayer’ – which ends with ‘Oh, for the wings of a dove’ – is closely bound up with this crucial moment in the history of English organ building. On 30 September 1840 in the City of London church of St Peter’s, Cornhill, Mendelssohn came to test a new German-style organ with full pedal board designed by his friend, the organist Henry Gauntlett, and built by William Hill. A unique record of this private event survives in the organ loft of the church to this day: it is a copy of the theme from Bach’s Passacaglia bwv 582 in Mendelssohn’s hand, signed by Mendelssohn. The autograph hunter on this occasion was the church’s organist, 20-year-old Elizabeth Mounsey, a former child prodigy and one of the first organists in England (along with Gauntlett) to learn to play with pedals. Thus began a friendship and working relationship between Mendelssohn and Bartholomew that culminated in the triumph of the first performance of Elijah in 1846, for which Bartholomew created an English libretto at incredible speed. Initially, Bartholomew had aspirations to be Mendelssohn’s opera librettist, but all the texts he sent were declined by the composer. However, Bartholomew’s extraordinary skill as a translator, evidenced by his English version of Spohr’s opera Jessonda, did attract Mendelssohn’s attention; a relationship of mutual respect developed between the two men and Bartholomew created English versions of many works by Mendelssohn. In agreeing to compose ‘Hear my prayer’ Mendelssohn fulfilled Bartholomew’s greatest wish – to have his own poetry set to the music of his dear friend. The text of this ‘sacred solo’ is Bartholomew’s own paraphrase of verses from Psalm 55. 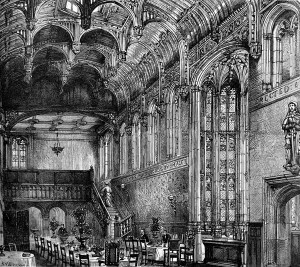 The first performance took place on 8 January 1845 in the medieval Great Hall of Crosby Hall. Built in 1466 by the wool merchant Sir John Crosby, this grand medieval palace in Bishopsgate had by the 19th century become a historic anomaly in the commercial heart of the City of London. Just three rooms of the original building remained in 1841 when restoration work was undertaken in preparation for a series of concerts organised by Ann Mounsey, a former pupil of Wesley and Attwood and the teacher and older sister of Elizabeth Mounsey. At the first performance of ‘Hear my prayer’, Ann Mounsey played the organ accompaniment on the new organ by Henry Cephas Lincoln, and the soprano solo was sung by Elizabeth Rainforth, a well-known stage singer; according to a review of the performance published in Musical World, neither the soloist nor the chorus were ‘thoroughly at home’ and the new organ also met with little enthusiasm. (The modern-day popularity of the work stems from the recording made in 1927 by boy treble Ernest Lough which became EMI’s first million-selling classical recording.) The room in which the first performance took place still survives: in 1910 it was relocated to Cheyne Walk in Chelsea, where it now forms part of the London house of Christopher Moran.